Did you then go for a walk to check your solar inverter? Is it worth repairing a broken solar inverter? Why do Solar inverters show errors? Has your solar system been working flawlessly for years until just recently? Did you get a rude shock on you electricity bill only to find it was an extra $500 compared to what it should have been? We hope that the solar power company you purchased your solar system froma few years ago is still in business. However, given our knowledge of the solar industry we are not surprised if the scumbags have gone under and have left your solar inverter warranty worthless. Look at all those broken solar inverters that have accumulated over time. Wave goodbye as they are about to be taking to the recycle yard. It is often too costly and time-consuming to repair them. Damn, your solar inverter has a red light? After further inspection you now see an error code displayed on the LCD screen! More than likely your solar inverter has just died! It’s now time to replace your solar inverter. Queensland Solar & Lighting are currently doing around 1-5 Solar inverter replacements per week. We replace more solar inverters in Summer than in Winter. This would happen as the inverters are running hotter in the hotter months. This causes them to overheat and stress. Solar inverters like to be as cool as possible. Look at this Fronius Primo inverter installed on the side wall of a house. This is ok if it is a South, East and possible West facing wall. However, A North facing wall will almost always ensure a shorter inverter life. No. By the time you pay an electrician to pull the old inverter off the wall, send it to someone who can fix the inverter, and have an electrician re-install the inverter you have saved a few hundred dollars at most. You are then left with an inverter that is usually still out of warranty. I have heard of some inverter repairers giving a measly 3 or 6 month guarantee on their work. We’ve all heard the old, “A poor man pays twice”. If you can’t get through to a solar inverter Manufacturers office in Australia, it’s more than likely they’ve gone belly-up, along with your solar retailer who sold you the system. Unfortunately you’ve just got to buy a new inverter. Solar inverters will usually show an error code to let you know that there is something wrong. You can ring us up with the error code and we can let you know what it means and waht you can then do about it. It is quite obvious as to why many solar inverter Manufacturers instruct not to install solar power inverters in the North-facing sun. Some solar panel inverter manufacturers refuse to honour the warranty if their solar inverter was installed in direct North facing sun. It’s a known fact that the sun and heat kills the solar inverters. If you think that your panels are nearly ready to ‘give up the goast’ aswell, you could see what solar system packages we are currently offering.Sometimes replacing the whole system is the best thing to do. 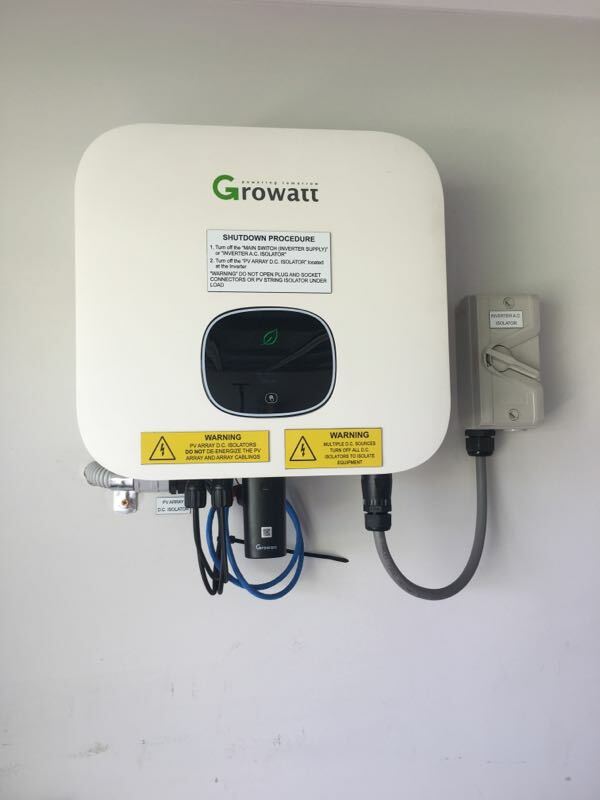 This is the New Growatt X Series (Growatt – 5000TLX) inverter we installed inside a garage. However, we’ve been installing them inside garages. That way it keeps it nice and shelted from the harmful sun. You can find the list of current approved solar inverters here. All inverter pricing below includes GST. The price represents your existing solar inverter taken off wall, new inverter installed, and old inverter being taken away. Replacement solar inverter prices below are for a good quality Single phase Chinese inverter. Either a Sungrow, Growatt or Zeversolar would be recommended. Most inverters offer a 10 year warranty as standard now. If you would rather a more expensive European made inverter, or a price on 3 phase inverter, please call 0756363692 or email us.